Nestled on the shore of Lake Winnipesaukee in the quaint village of Meredith, Mill Falls awaits you. 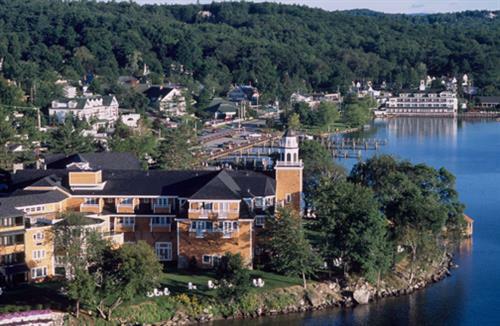 The four charming Inns, all within walking distance offer 172 designer decorated rooms, most with a fireplace, balcony and with panoramic views of the lakes and mountains, 7 distinctive restaurants, the world-class, full-service Cascade Spa, yoga studio, 1 outdoor and 2 indoor pools, 2 sandy swimming areas, plus 15 unique shops and galleries. The Inns offer the calm and peace of the country with the amenities and service of a resort hotel. Mill Falls also provides and extraordinary venue for your next event with lake view function facilities accommodating groups of 5 to 300 people. 7 restaurants, full-service Spa, 1 indoor pool and 1 indoor / outdoor pool, a sandy swimming area, plus 15 unique shops and galleries. take I-93 to exit 23. Follow 104 East to Route 3 North, turn left at the light. The Inns are 1/2 mile down at the Junction of Routes 3 and 25.